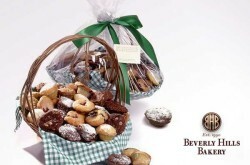 Gift Basket Delivery by Beverly Hills Bakery London. Beverly Hills Bakery London offers a truly worldwide cake & gift tin delivery service of gift baskets filled with freshly baked hand made mini muffins, cookies, brownies, cupcakes and cakes & pies. Gift baskets delivery throughout London Area, UK outside London area, Europe (not UK), North America (United States). 77E King Henry’s Rd, London NW3 3QU, UK.